Adhesive for Large Format Porcelain Tiles, our top recommendation. Unsure which adhesive to use with a large-format slab? We recommend the use of ARDEX adhesive which has been vigorously trialed and tested to ensure high performance with extra big tiles. These products are compliant with BS EN 12004: Adhesives for Tiles and offer outstanding adhesion. ARDEX high performance floor and wall tile adhesives have unique benefits when used in conjunction with a large-format slab. High yield, ultra-rapid setting properties allow grouting to start after only 60 minutes in some cases. ARDEX MICROTEC® products are ideal for solid bed fixing large format tiles as they have C2 cementitious based adhesive properties, although we always recommend buttering both sides of the tile for maximum bonding. Wondering about how your adhesive contributes to environmental assessment standards? LEED points are up for grabs for most of the adhesives we recommend. ARDEX X77 MICROTEC, ARDEX X78 MICROTEC, P51TM Primer and P71TM Primer all offer at least 3 possible total LEED points. They are low on VOC emissions which is great for indoor environmental air quality. ARDEX also holds an ISO 14001:2004 registration. 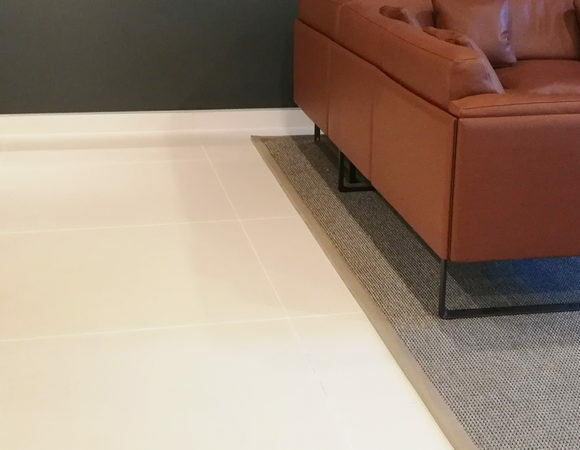 ARDEX provide comprehensive support including product training and consultation and are familiar with the specific requirements of installing large format porcelain slabs. It is recommended to seek the advice of an expert to identify which products are best suited to your project depending on the type of substrate present. Contact us on info@ecofriendlytiles.co.uk to request a copy of our Installation Guide with our full list of recommended grouts and adhesives.